Sterling Silver Lovebirds Earrings by Metal Arts Group. In the Haida and Tlingit Tribes of the Northwest Coast there are two main clans, the Eagles and the Ravens. Because traditionally members of the same clan cannot marry, marriages between the two clans are signified by the joining of an Eagle to a Raven. 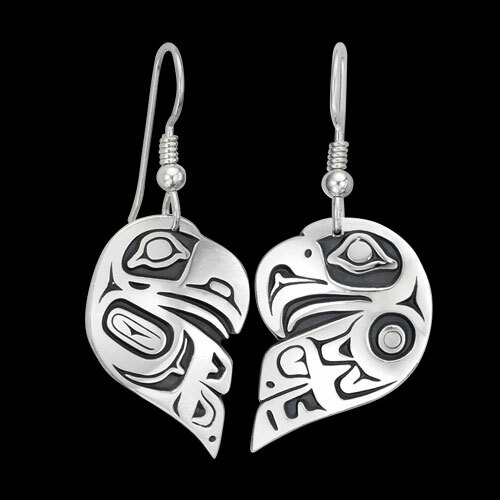 When linked together they are recognized as "Lovebirds" and represent the strength and power that comes from their union. 0.7 x 1 inch Sterling Silver Lovebirds Earrings by Odin Lonning. Made in USA.